The top college football teams in the nation continue to jockey for position for a favorable spot in the BCS rankings as the season winds down. However, I am more concerned with the mid-major teams that are fighting just to get into to a bowl with the mandatory six wins. This kind of motivation has a way of dramatically shifting the edge in a couple of matchups if you know where and how to look. The money train went completely off the tracks this past week with a 0-3 record on my top plays. This downturn took me back under .500 for the year at 14-15-1. Not to be discouraged, I dug even deeper into the mid-major matchups on this Saturday’s schedule in search of a few “diamonds in the rough”. The following are my three top college football picks for Week 11 using lines provided by 5Dimes. Kent State continues to roll towards the Mid-American East Division title with a perfect 5-0 straight up record in conference play. It is 8-1 SU overall and a very profitable 7-2 against the spread. The Golden Flashes big claim to fame this season is a relentless ground game led by Dri Archer and Trayion Durham, who have already combined for 1,779 yards rushing and 21 touchdowns. Miami has now lost three of its last four games with this past Saturday’s 27-24 setback to Buffalo as a three-point road underdog. The Redhawks are 4-5 SU on the year and just 2-6-1 ATS. The main problem with this team has been a very inconsistent defense that has been torched for an average of 34.4 points a game. The Golden Flashes come into this matchup with revenge on their minds after dropping the last two meetings by a combined six points. Prior to that, they had beaten in Miami in three of the four previous meetings both SU and ATS. The balance of power in this year’s matchup is definitely back in Kent State’s favor. Western Michigan comes into this MAC showdown at 4-6 both SU and ATS and needing a win in its last two games to qualify for a bowl. The Broncos have had little problem putting points on the board this season behind a passing game that is averaging close to 300 yards a game. Most of their games have become track meets with a defense that is giving up (29.8) almost as many points as they score (30.5). Buffalo snapped a six-game losing streak with its win over Miami (OH). It was the first time the Bulls managed to score more than 20 points in their last four games, and their average on the year is just 21.1 points per game. The defense has not helped the cause by allowing over 30 points a game to its opponents. The road team in this series is 4-0-1 ATS in the last five meetings, but the Broncos are a perfect 5-0 SU dating all the way back to the 1999 season. Given the current form of both the Bulls’ offense and defense, there is little chance they will be able to keep pace with Western Michigan for all four quarters. Look for Broncos quarterback Tyler Van Tubbergen to keep things rolling, in place of the injured Alex Carder, with another big day. The Thundering Herd have been able to grind their way to a 4-5 SU (3-5-1 ATS) record with two crucial victories in their last three games. With season-ending contests against Houston and East Carolina, this game is a must-win to keep any bowl aspirations alive. 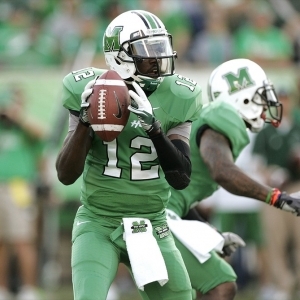 Rakeem Cato continues to put up big numbers in the passing game with 3,290 yards and 27 touchdown throws to help lead Marshall’s offense to an average of 39.7 points a game. UAB’s bowl chances disappeared a long time ago with just two wins on the year. It is 4-5 ATS this season overall but a costly 1-4 ATS at home. The Blazers’ offense still has some juice with close to 30 points a game, but their defense is one of the worst in the nation in points allowed by giving up an average of 36 points a game. This game should be a high-scoring affair between two teams that love to air it out. The problem for UAB is that it just does not have the horses to run with the Herd. Marshall has won the last three meetings both SU and ATS and makes it four straight both ways with a relatively easy victory this time around.